KarmaKulture Glass Jewelry is made by Irish designer and artist Trace Palmer. Trace Palmer immigrated to the United States in 1996 from Belfast, Ireland. 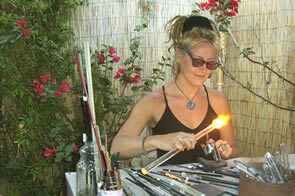 While living in Eugene, Oregon, she became inspired by the art of glass blowing. Trace began experimenting with the glass medium creating her own self-taught style. Her original handmade glass jewelry is combined with designed necklaces crafted with materials such as suede and leather, sterling silver, and semi-precious stone beaded necklaces. Her KarmaKulture line also includes enchanting glass rings, glass earrings and glass bracelets. Palmer's unique contemporary glass jewelry is her interpretation of traditional Celtic mysticism. Her glass jewelry designs have been worn by Sharon Stone in Cold Creek Manor and Lisa Kudrow's Phoebe characters in Friends. Other KarmaKulture-wearing celebrities include Hilary Duff, Pamela Anderson, Liza Minelli and Farah Fawcett. Check the In The Media page for further media appearances or view a video on how glass jewelry is made. 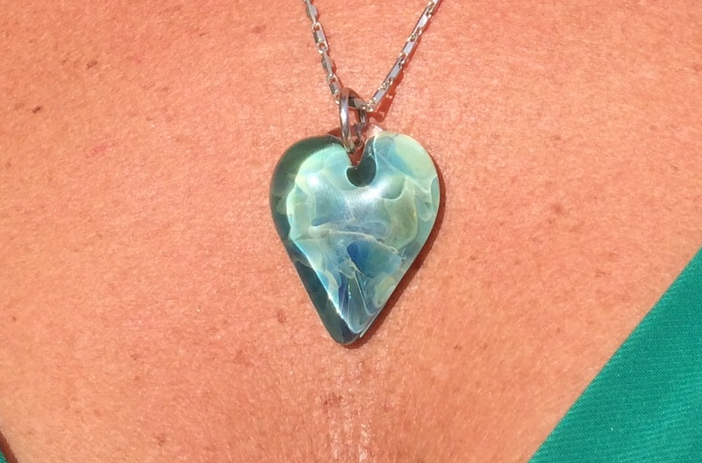 All glass pendants are made from PYREX glass, a very strong glass. They are melted on a torch and manipulated using the natural force of gravity without the use of moulds. Each pendant is individually, free-hand sculpted from a solid rod of clear glass. The color glass is melted on the back to create the design and a background color is layered on last. The color glass is made from natural minerals including copper, silver, gold and cobalt. When each piece is complete it is placed in the kiln overnight to anneal, which increases the strength of the glass by adhering the molecules together.